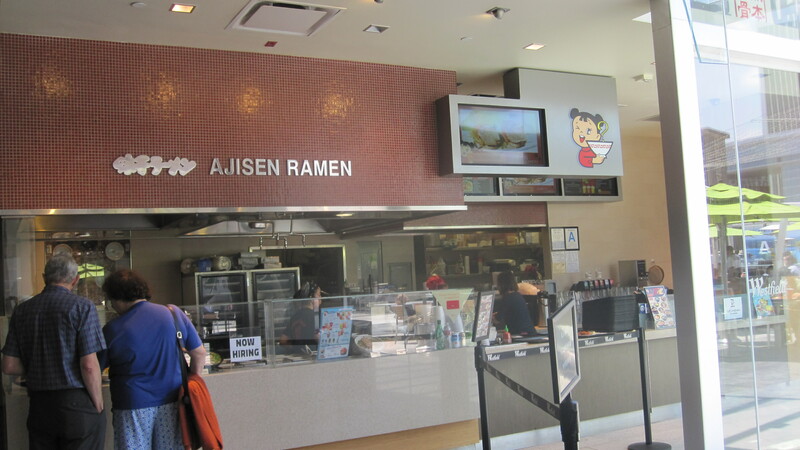 If you’re looking for a decent bowl of ramen but don’t want to endure a long wait, head over to Ajisen Ramen in the Westfield Century City mall. Even though Ajisen is also a chain restaurant, the food is better than over at Chipotle and Panda Express (which both have much longer lines). My daughter, being a ramen maniac, loves Ajisen Ramen (currently ranked #2 on her favorite ramen list). Once you place your order with the cashier, you are given a buzzer. Several years ago when Houston’s first opened in the mall, the same type of buzzer was handed to you after you placed your name down on the waitlist. Now I guess the technology is so cheap that both Ajisen Ramen and Take a Bao (also in the food court) hand them out as a way to announce your order is ready. It’s better than hovering at the counter and allows you to find a table. Once the buzzer lights up, it’s time to pick up your order. My daughter and I get the Ajisen Ramen, which comes with pork, seaweed, cabbage, egg and green onions. Unlike Tatsu where the egg is soft-boiled, this egg has been cooked in soy sauce. I never bother to ask them to hold the toppings for my daughter’s ramen in hopes that one day she’ll start eating them. This approach paid off the other week when she actually ate her pork. No such luck on the veggies though (more for me). They offer several different ramen, including a Seafood and an Assorted Vegetable (which my husband usually orders). There’s also a premium pork ramen which I prefer since the pork is sliced thinly. For some reason, it doesn’t sit well with me so I stopped ordering it (fool me twice, shame on me). My husband recently tried a fish curry plate, consisting of fried fish, curry sauce, rice and salad. He enjoyed it as a ramen alternative. Ajisen started in Japan so you know it’s authentic! Supposedly they have over 600 outlets, mostly in Asia (we even spotted one in the Hong Kong International Airport) but have only started expanding into the US (more specifically, California). Hopefully they’re successful and will continue to bring tonkotsu ramen into malls all over America! Location 10250 Santa Monica Blvd., Los Angeles, CA 90067. Also in Irvine, San Gabriel, Rowland Heights, San Francisco, San Diego and Temple City.